The Obama Administration and U.S. Congress are in the midst of making critical decisions to advance the President's $63 billion Global Health Initiative (GHI), the FY11 budget, and broader foreign aid reform. Meanwhile, Washington State remains on the frontline of U.S. global health activities, with exceptional engagement by industry, foundations, universities, the private sector, and implementers. At this critical juncture, Washington, DC policymakers came to Washington State on July 29 to better connect with stakeholders, update them on GHI, and bring their perspectives back to the nation's capital. 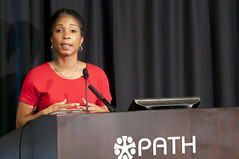 This Washington-to-Washington event took place in PATH’s new headquarters, bringing together representatives of the Bill and Melinda Gates Foundation, PATH, CSIS, the State Department, CARE, the Washington Global Health Alliance and others. Find an archived webcast of the July 29 event here. In her early contribution to the dialogue, Washington Governor Chris Gregoire said, “As true believers in innovation, Washingtonians know simple new ideas—whether they involve efficient delivery of vaccines or caffeine—can change the world. And, as the most trade dependant state in the nation, Washington is keenly aware that our success depends on having health partners with which to trade. But most of all, global health is a field in which our cherished values of innovation, partnership and persistence are perfectly matched to our value of compassion.” You can download her full remarks here. Find photos of the July 29 event here.